One of the primary ways I still mother Xavier is through creating things. Whether I write, sew or scrapbook, I feel solace when I set aside quiet time and make beautiful things in his memory. It is a way to connect and reflect and most of all, continue to make room in my life for him. 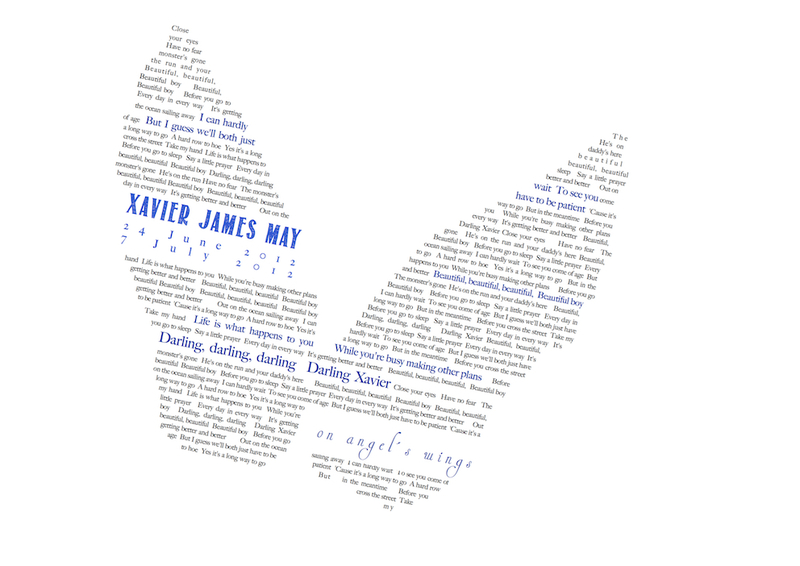 I wanted to share how I made this text butterfly so that others might be able to create something similar for their loved ones gone too soon. Firstly, find an image that has a clear outline that speaks to you – perhaps wings, a heart, a flower, etc. 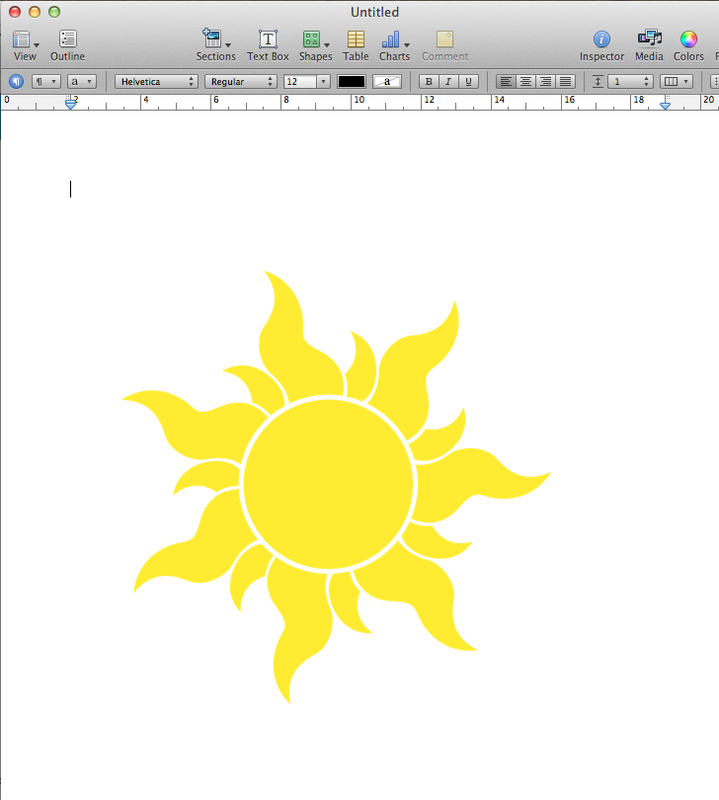 Create a new pages document and insert the saved image. 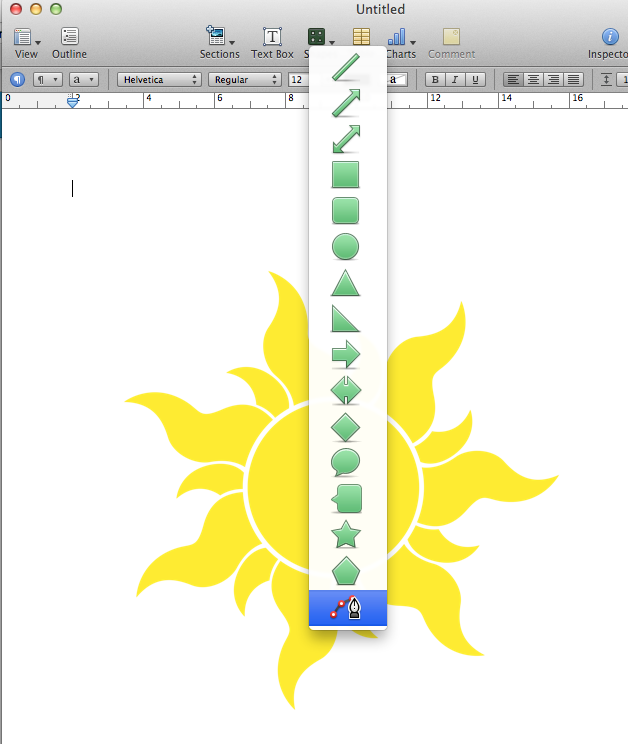 Choose the free draw tool from the shapes menu. Trace around the edges of the image. 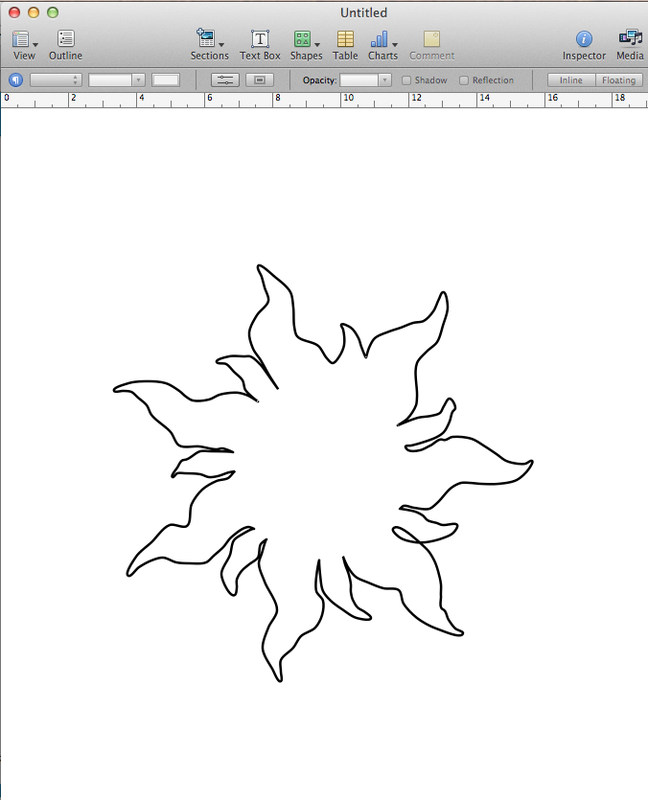 To soften the lines use Format > Shape > Smooth Paths. 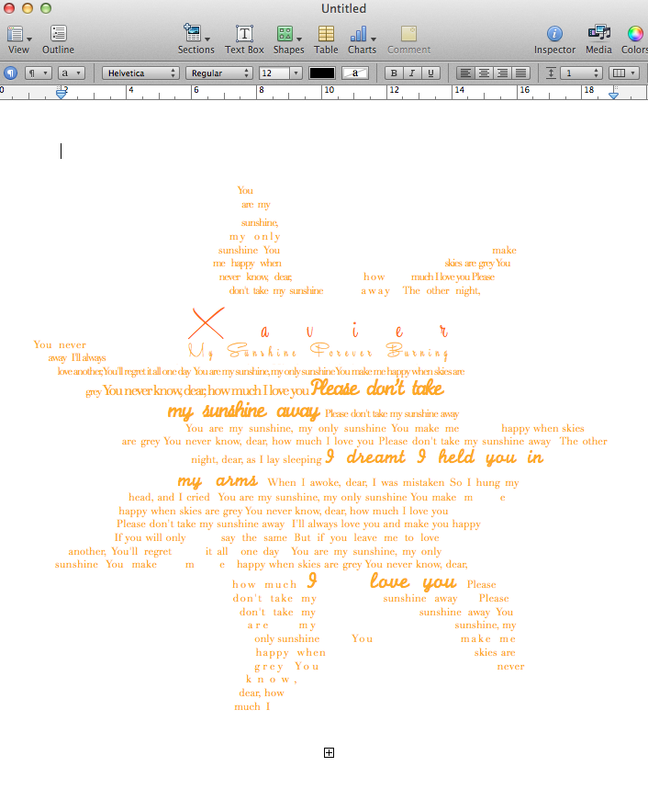 Find the lyrics, verse or prose you want to form the text part of the image. Copy them to the clipboard and then paste into a new pages document. 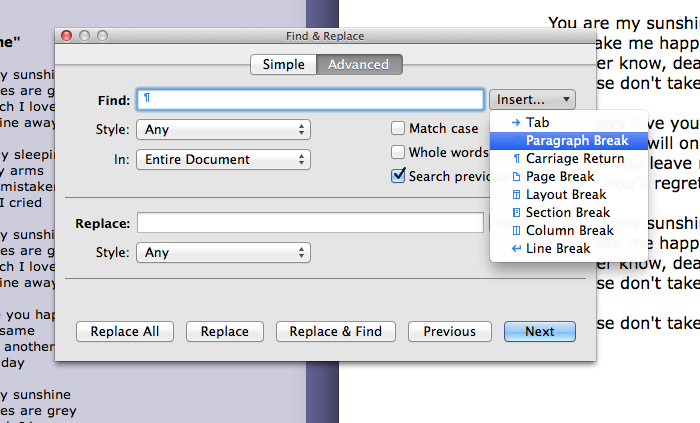 Find all the paragraph markers and replace with a space using the find tool. 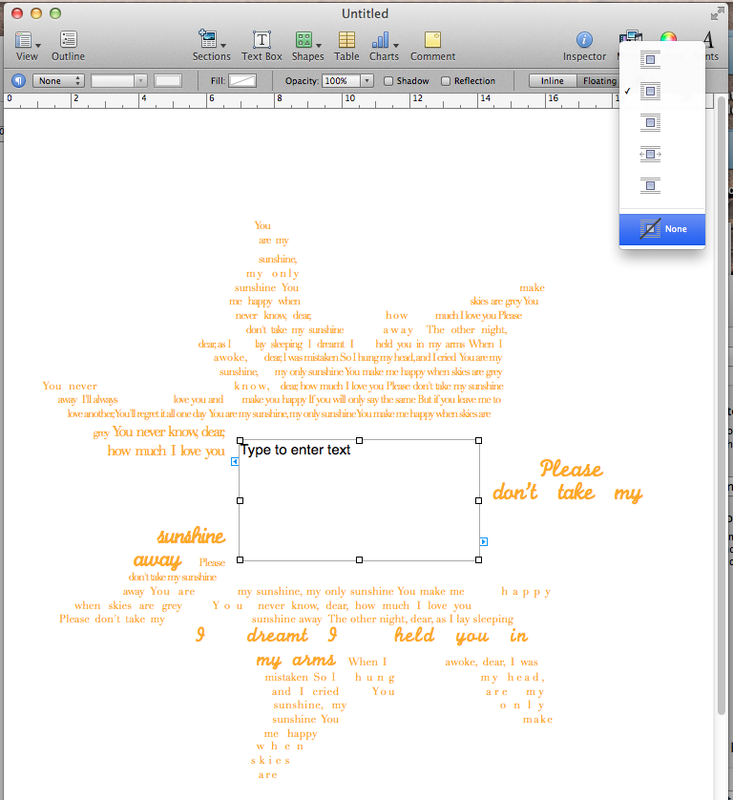 Copy the resulting text. 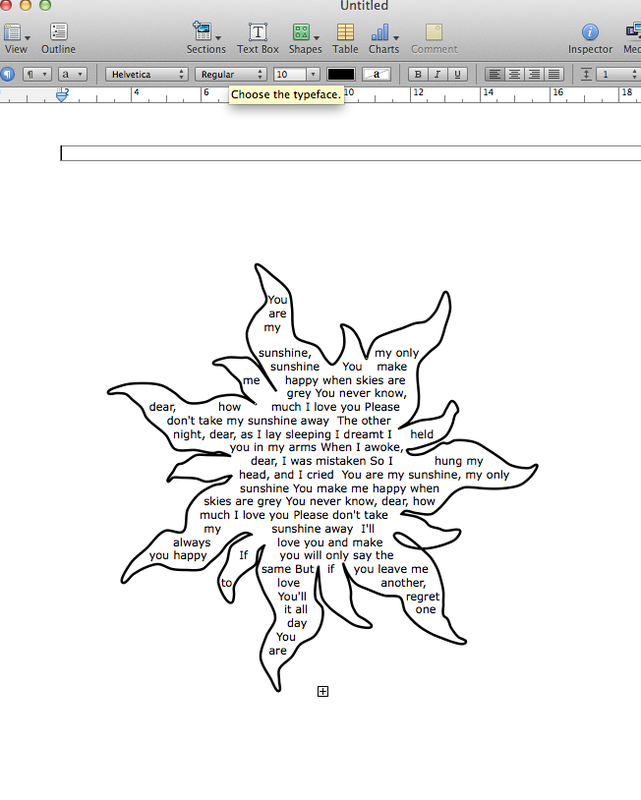 Back in the document you originally created, double click on the shape and paste the copied text. You might need to paste it a few times to fill the space. 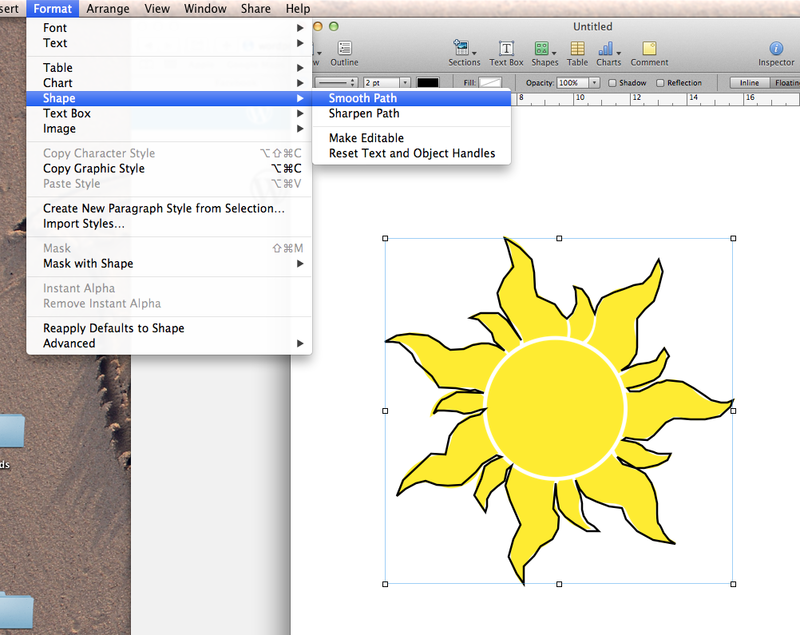 Click on the outline of the shape and choose no fill as the line colour. Click on the inspector and go to text. Justify the margins. You can also alter the character ligature and line spacing here. You may like to change the font. If you don’t like the options available, download a font you like. 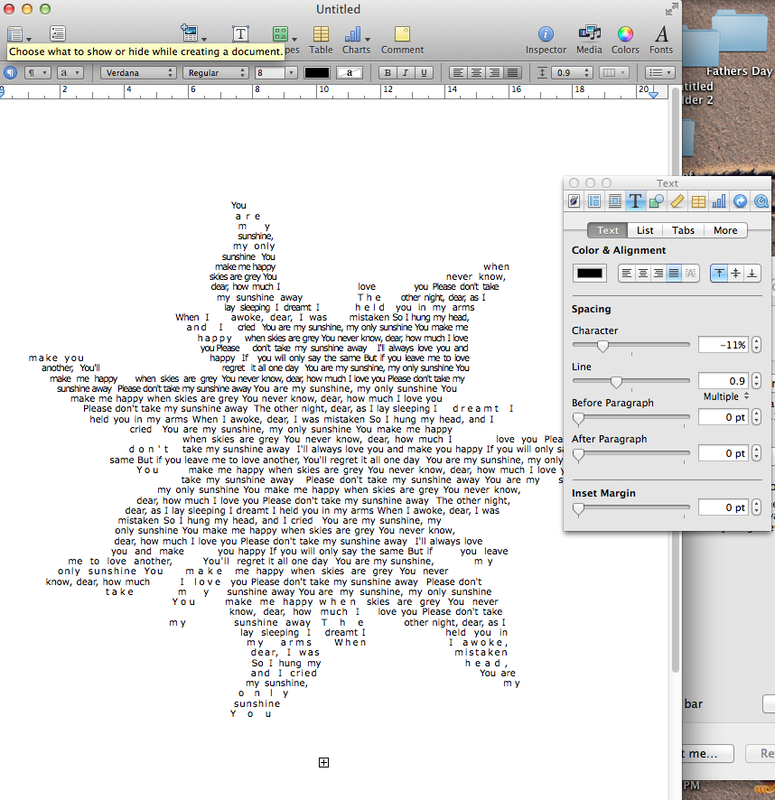 There are some great font resources on the web, I like fontspace the best. 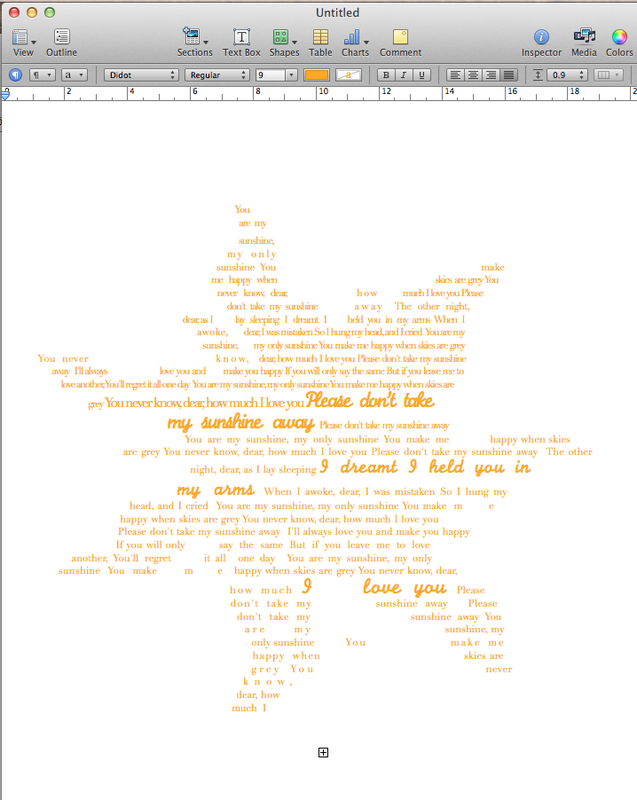 You may like to pick out words and phrases that mean a lot to you and change the colour, font, bold or size. 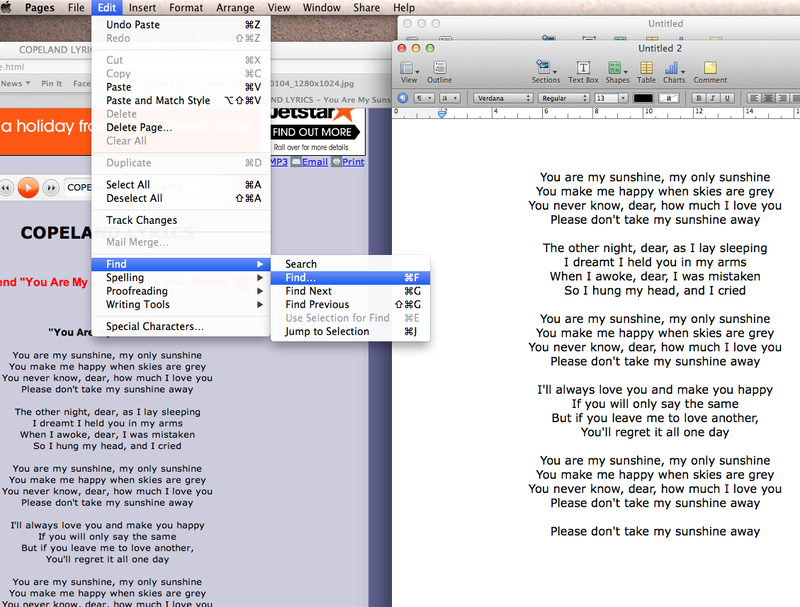 To quickly change the size in pages, select the word/s and press control and +. To add the name and dates, create a text box. Change the properties to floating. Place this onto the shape and type your names , dates or other messages. Edit the font size, colour etc. to your liking. Save the document. You may like to export to a PDF for easy printing.